The Doubledisc Valve is a take-off on the Minidisc’s angled configuration of the disc and stem. It has been carefully re-engineered into a double-disc, sharing one stem and controlling two ports. This unique disc design creates a true T configuration sanitary divert valve. A half turn of the handle causes quick, positive shut-off in one port and opens the other port completely. Because it is a disc valve, the Doubledisc offers lower flow resistance than the standard divert valve. 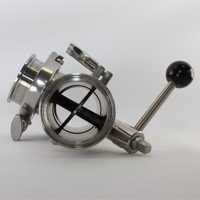 It is hydraulically balanced and excellent as a regulating valve: the handle remains in any desired position. It is flush draining and has no sump. Two leak detector holes warn operator of faulty stem "O" rings. It meets all 3A standards and is suitable for all food or sanitary applications.